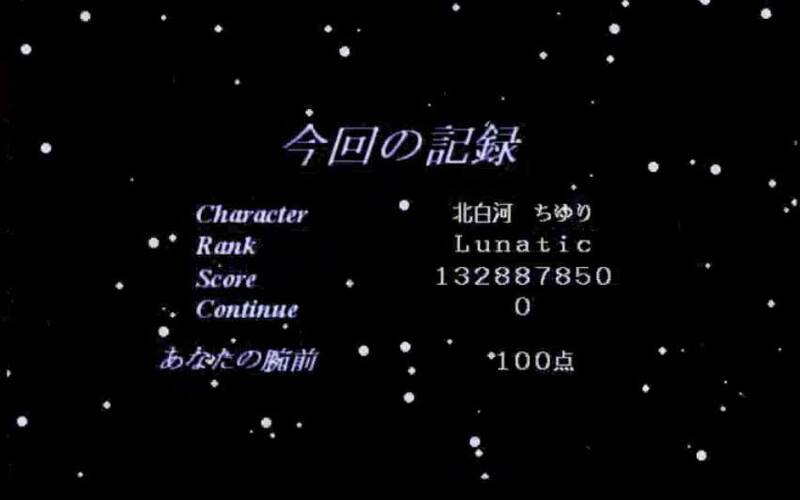 This is a highscore board for Touhou 3. It includes scores from all sources that I am aware of. At the moment, the cut-off for inclusion will be 80 million, though I may raise this later. If you know of a score that should be on here, please tell me. First column: player. Second column: score. Only scores of 80 million or more are heeded at the moment. Third column: character. Fourth column: stage reached. C is for "clear." The number after is the spare lives left in stock. Fifth column: date. The dates are just from the first instance I can find of the given score being made public. Naturally some are older than the date would suggest. soulgohappy - aka 無断転載, Koryu. Older than 2012, if memory serves. The player has at least 7 higher scores, though they are too blurry to make out. All appear to be 8 digits. The video was uploaded to several sites. The only one of these I still have the link to is now gone; however, I captured a recording of the original upload for myself (back when this was the only Chiyuri clear I knew to exist) and still have it on my computer. Sadly there is no universal repository for scores. Different players post scores in different places. Some are kind enough to post them nowhere. Good places to look for scores are: Restart Syndrome, Maidens of the Kaleidoscope, Eientei Forums, Shmups Forum, and wherever else the links above may lead you. At this moment, Restart Syndrome is used by most of the best players. If you're looking for the most recent records, look there. MotK has a lot of old lower scores from random players. Some higher scores can be found in the thread itself that aren't in the actual scoreboard since those players left the site. The shmups forum scoreboard also has some old scores.